Disclosure: This post may contain affiliate links that earn me a small commission, at no additional cost to you. I only recommend products I personally use and love. *UPDATE: I revisited this recipe in 2018, using an Instant Pot. Click here to see the updated recipe! So I made this delicious roast almost two weeks ago. I know it’s been silly long but I’ve been so busy with schoolwork that I couldn’t find any time to write this post. 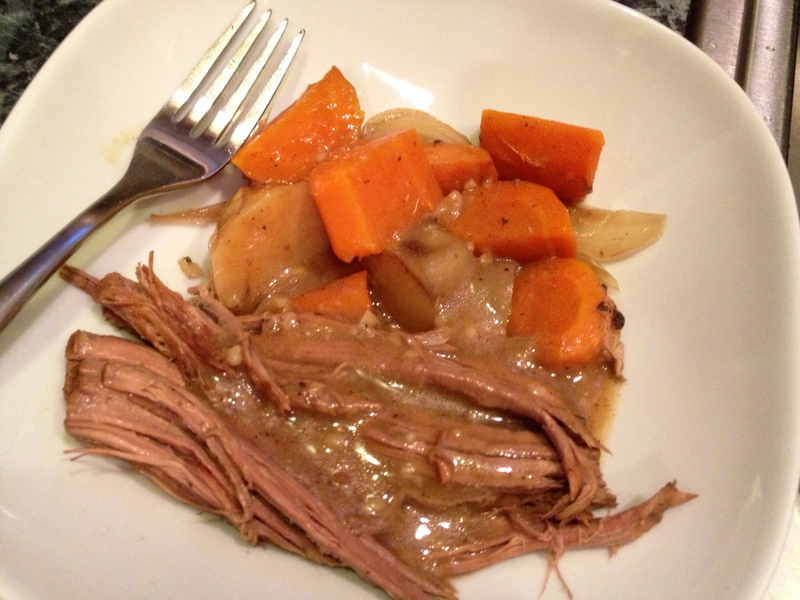 So yeah, two weeks ago, I made my best roast AND my first successful gravy! So let me tell you all about it! 🙂 As some of you might recall, I was ridiculously proud when I got a super bargain on apples and carrots at the local market a couple weeks ago. The apples quickly turned into a delicious apple pie and the carrots made me want to cook my first roast of the season. So after the market, I went to the grocery store to look for some meat to roast. I wanted something cheap but also not too big. I finally settled on a bottom round roast. I started the roast on Sunday morning to let it cook all day. By dinner time, it was perfectly cooked, and the smell throughout the house was divine! Put to roast at the bottom of the slow cooker and cover with carrots, potatoes and onions. Add everything else. 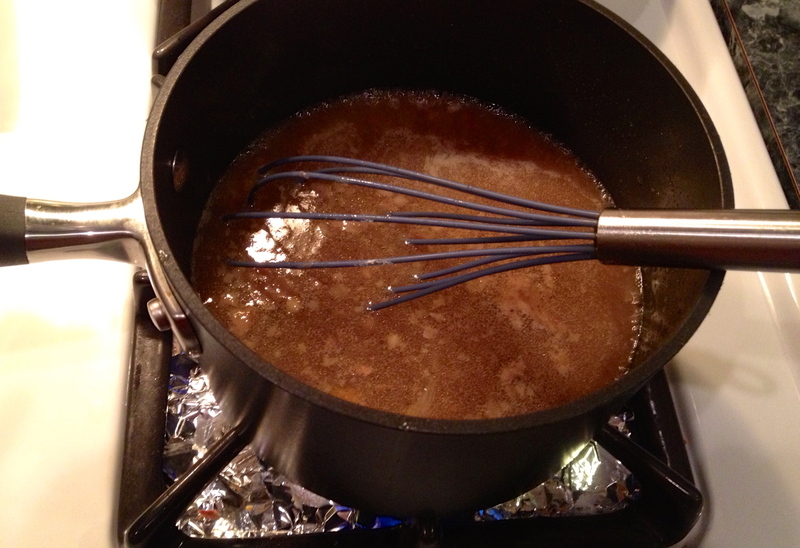 You can adjust the quantity of beef broth to make sure you cover the roast. You can also add water if necessary. 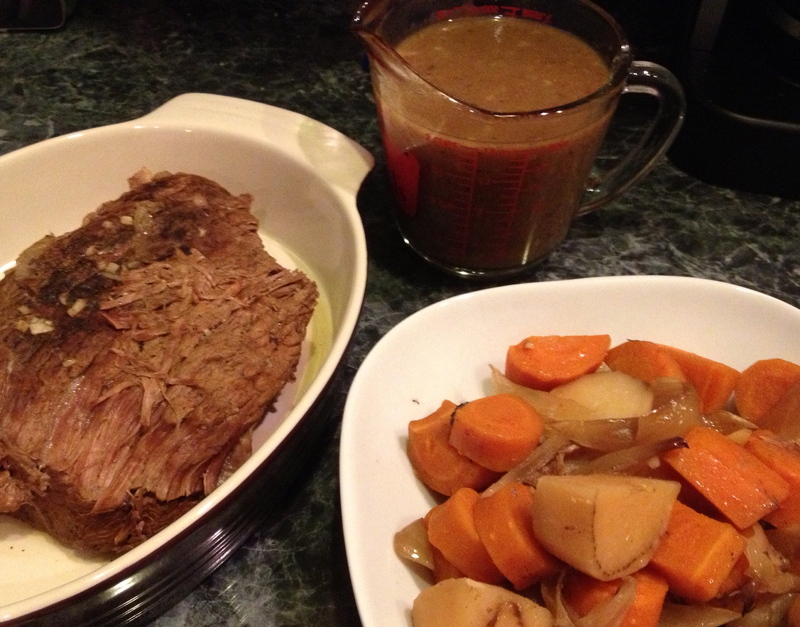 Remove the roast and the vegetables from the crock pot. Take the leftover liquid and put it in a small saucepan. Cook on medium heat and whisk in some flour. The quantity of flour depend on how thick you want your gravy to be. You could also use cornstarch but I was out, which is why I used flour. Lower or bring up the temperature as needed, add extra flour as needed as well. If you want, you can make your gravy go through a strainer to get rid of the chunks of onions, beef and what-nots that might be in there but I actually liked that so I didn’t care to drain it. Serve that goodness over your roast and enjoy!! Voilà! This was such a simple meal to prepare and it was so very satisfying. And as a bonus, we had TONS of leftovers. I’m actually kind of sad that I didn’t freeze half of it right away as I did end up having to throw some of it away at the end of the week. Previous postFabulously Natural Apple Pie!